An amazing, interesting, and strangely satisyfing dish...like nothing I've ever tasted before! Every flavor imaginable is featured: bitter, pungent, tangy, salty, sweet...and each one is extremely prominent. Poblano (pasilla) chiles are first roasted, providing the bitter and smoky base. They are stuffed with a hearty, aromatic, crunchy, chewy, and everything else filling: mushrooms, garlic and onions, chopped pecans, raisins and dried mango, and thyme and (heavy) oregano for spice. The base for this filling, aside from the mass of mushrooms, is tomato puree. The dried fruits are a nice contrast to the earthy mushrooms and tangy tomato and add a tropical zest. The walnut cream sauce is a simple blender mixture of sour cream, chopped garlic, walnuts, and worcesteshire sauce. Its tanginess and creaminess are wonderful on top of such a hearty, earthy meal. 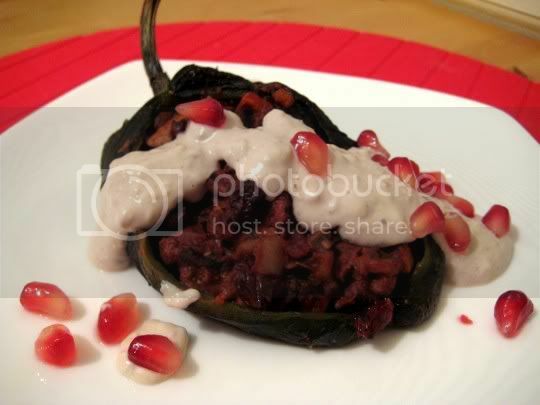 Pomegranate seeds, bursts of sweet and tangy, are sprinkled on top and add a sort of "fun" to the dish. Everything about this meal is appetizing...I mean, it even looks pretty! Make again? Definitely! This combines the two foods I'm not crazy about (peppers and mushrooms) and makes me want to go back for seconds! Even leftovers are delicious.